The Champion team posing with the senior management of TAR UC (from right to left): Johan Lim Kii Geat, Associate Dean (Management), Revathi Naidu A/P Rejaram Naidu, Isabelle Pong Wen-Xin, Cha Chin Seng, Datuk Dr Tan Chik Heok, President of TAR UC, Lee Peng Qing, Chong Hsien Leon, Tan Jye and Ms Wong Hwa Kiong, Dean of the Faculty of Accountancy, Finance and Business. Isabelle Pong Wen-Xin (second from right) won the Best Speaker Award in the competition, flanked by Datuk Dr Tan Chik Heok (second from left), Ms Wong Hwa Kiong (extreme left) and Mr Johan Lim Kii Geat (extreme right). 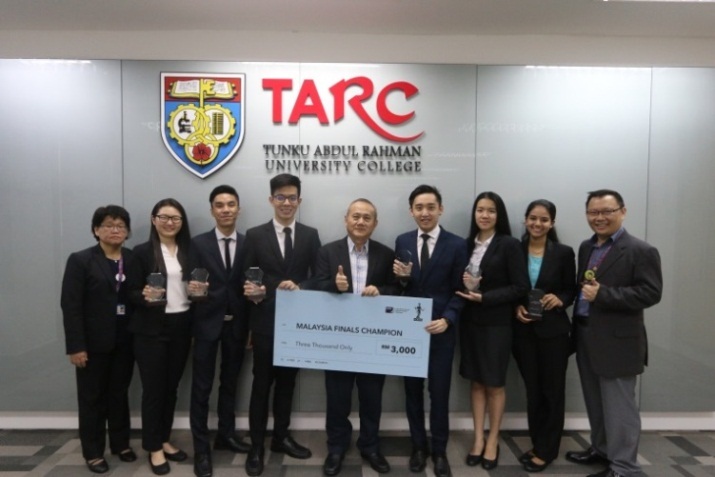 After winning the Champion title in the Northern Regional Heats held earlier, TAR UC team "TableMasters" once again stole the limelight when they won the Champion prize in the Malaysia Heats Finals of the Institute of Chartered Accountants in England and Wales ('ICAEW') Malaysia Regional Business Challenge on 3 May 2018. The team consisted of six Bachelor of Commerce (Hons) students, namely Cha Chin Seng, Isabelle Pong Wen-Xin, Lee Peng Qing, Chong Hsien Leon, Tan Jye and Revathi Naidu A/P Rejaram Naidu. The structure of the Malaysia Heats Finals was similar to the Northern Regional Heats where participating teams were required to solve a real life case study and present their thoughts and solutions to a panel of judges. TableMasters competed against 6 other teams before emerging as the Champion team. On what helped them to win in the competition, Peng Qing was quick to highlight that their mentor, Mr Johan Lim Kii Geat, who followed them to Jakarta to give them his moral support, had given them a lot of useful information beyond study materials which helped them to understand not only the theory but its application. Tan Jye, another member of the team also praised their mentor, Mr Johan Lim. "We went through the case study with Mr Johan Lim and practised a lot in front of him. He discussed with us on how to improve and gave us a lot of constructive criticism." Chin Seng, the leader of the team, talked about what motivated the team to win. "We worked hard and kept on taking challenges. We wanted to challenge ourselves to achieve something great before we graduate," he said. Then Isabelle Pong, who won the Best Speaker Award added: "We had to be confident in what we did. We had very little time to solve the case given to us but we worked together as a team and trusted each other to give our very best." Finally, Revathi spoke about how they managed to give their best despite the time constraints. "We didn't have much time to prepare as we were only given an hour. Within that time, we had to read the case which was thirty-seven pages long, solve the case, prepare the speech and slides and present it to the best we could and that really helped us win," she said. With this win, they will represent TAR UC and Malaysia as a country at the ICAEW Southeast Asia Regional Business Challenge Grand Finals held in Jakarta, Indonesia on 17 May 2018.